Attitude Industries has spent a lot of time on the 800 E-TEC Turbo kit. Nearly two years of testing before we even released this kit to the general public. From top to bottom this kit is designed to perform on pump or race gas. The heart of the kit is an oil less Billet Turbo. This not only makes for an easy install, but eliminates the need for an oil tank and oil pump. A special designed Turbo Muffler, with double down pipes not only adds to the great throttle response, but also keeps your sled from making to much noise and keeps nearly a stock sound. The chrome looks great when you open the side panel to show of your kit to your friends. The large volume air box is also the key to why this kit shines. The large volume increases throttle response, lowers intake temps, along with creating a more efficient boost. Also with the fuel rail and extra injectors all built in one, makes for an easy install, and the air box bolts on, along with a J bolt to make sure it never blows off and keeps the o-ring seal nicely seated. Factory cold air intake keeps from having that annoying filter from hanging out the hood, which can not only get knocked off when boondocking, but who really wants to cut a hole in your hood. We also designed or own custom clutching. Most kits run the stock secondary and just change up the front. We've had our own cut helix and include tuned set up to get the most out of your sled. This kit is as simple as they come. TRUE BOLT ON HP! Not a bunch of silicone intake parts that just get you into a cheap kit. We include everything in our kit so no add-on parts are required. 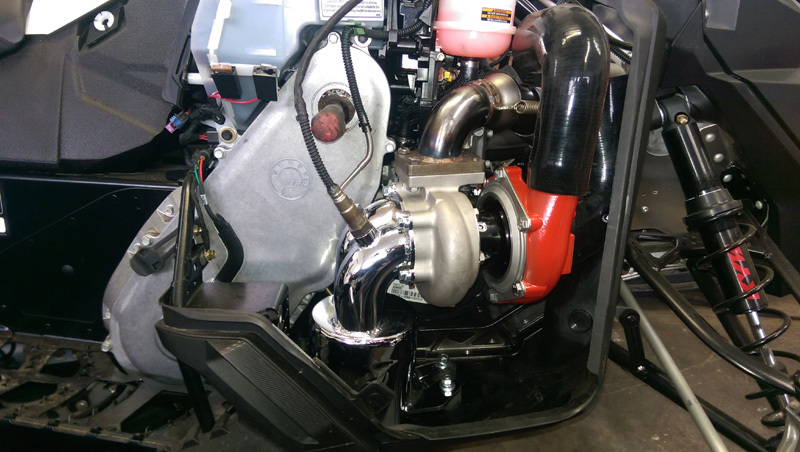 The 800 E-TEC turbo kit is 100% complete. We also offer FREE install on the kit for anyone who brings their sled to Salt Lake City, Utah.